Ansar al-Shari'a ("Supporters of Shari'a") was once Libya's most familiar jihadi organization in the post-Gaddafi environment, widely suspected of involvement in the attack on the U.S. government presence in Benghazi in 2012. It was closely linked to the Ansar al-Shari'a of Tunisia, many of whose members took refuge in Libya following a crackdown by the Tunisian government, which declared Ansar al-Shari'a of Tunisia a terrorist organization in August 2013. Since 2014, Ansar al-Shari'a in Libya went into significant decline. A thorough overview of the group's rise and beginning of its loss of influence in the period c.2011-2015 can be found in a lengthy paper for the Hudson Institute by my friend Aaron Zelin. In brief, the two main reasons for the group's decline were the military campaign launched against it by Libyan general Khalifa Heftar, which shifted much focus away from da'wa [Islamic proselytization] activity and social outreach across Libya, and the rise of the Islamic State in Libya, which absorbed many of Ansar al-Shari'a's networks. However, it must be stressed that contrary to common perception, the organization as a whole never pledged allegiance to the Islamic State, but rather remained ideologically aligned with al-Qa'ida. Sample Ansar al-Shari'a social outreach in Sirte, western Libya, September 2013. The city would later become known as the Islamic State's main stronghold in Libya, as it absorbed the Ansar al-Shari'a network there. The newly released statement announcing the group's dissolution does not come as much of a surprise considering that the group's output on social media had almost completely disappeared, with the last item before this statement put out several months ago. The statement alludes to some of the points made above: for instance, the loss of key leaders and cadres and the emphasis the group had on da'wa and social outreach. Like Ansar al-Shari'a, the Islamic State in Libya has also experienced a significant decline, lacking real control of territory. 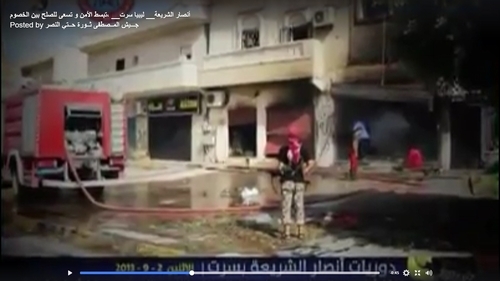 Its main governance projects in Derna and Sirte have both collapsed. However, it should not be thought that the wane in fortunes for Ansar al-Shari'a and the Islamic State means the end of jihadism in Libya. 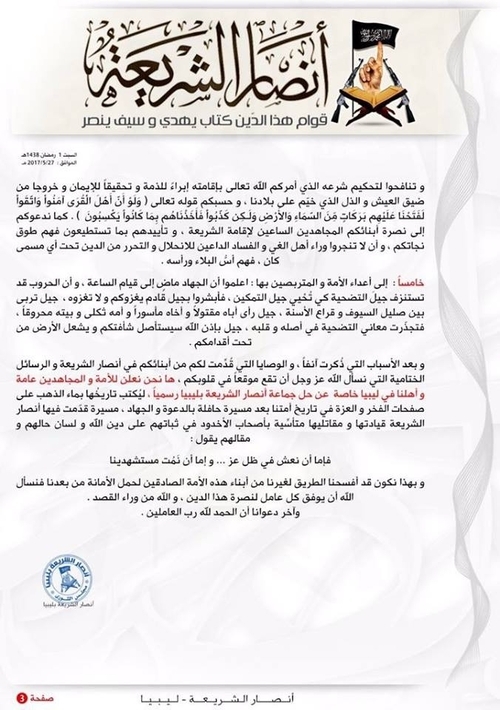 There are still other active jihadist groups in Libya like the Derna Mujahideen Shura Council, in which Ansar al-Shari'a had participated as a junior actor. In addition, the country's vast expanse and continuing civil war chaos provide ample training ground space for jihadists and potential bases for remote direction of operations abroad or to dispatch operatives from Libya into neighbouring countries (e.g. Tunisia and Egypt) and beyond. How exactly the Libya connection may have played out in the recent Manchester attack- claimed by the Islamic State and carried out by a British citizen of Libyan descent who travelled to Libya- remains to be seen. Below is the full text of the Ansar al-Shari'a statement translated, with explanatory notes in square brackets where necessary. The foundation of this religion is a book guides and a sword gives victory. The message has arrived and the masses of the people will bear it. May the religion's might return to it, may its glory return to it, may blood pour from us. A path taken from the Almighty's words: "We have sent Our Messengers with proofs and We sent down with them the book and the balance so that people may live in justice, and We have sent down the iron in which there is strong might and benefits for the people so that God may make evident who supports Him and His Messengers unseen. Indeed God is powerful and mighty"- doctrine and direction. A doctrine and direction whose banner the Ummah will bear generation after generation as the sheikh of the martyrs Omar al-Mukhtar [Libyan revolutionary who fought the Italian colonial presence]- may God accept him- expressed in his words: "It will be upon you to fight the next generation and the generations that follow it." Indeed they are the path of the book that guides and the sword that gives victory, a book that was the guiding light for the path of those men whose slogan was always 'Your sons in your service', who offered what they offered from goodness and exertion to serve the people and attend to their needs from securing areas and facilities, and from campaigns of da'wa, charity and conscious-raising, their caravans reached the east, west and south of the land, a path that the highwaymen, agents of the West, and patrons of corruption only wished to cut off, so there was the disaster of the so-called Dignity [referring to Khalifa Heftar's operation Dignity], and behold the sword that gives victory unsheathed from its scabbard to push back the aggression of the taghut [idolatrous tyrant] Heftar and his soldiers. A sharpened sword that pushes back the aggressor, offering forth blood and the lives of its bearers as cheap expenditure in the path of God and to support the oppressed, adhering to the command of God Almighty in His words: "And what is the matter with you that you do not fight in God's path and for the oppressed from the men, woman and children?" 1. To the lions of the den and the knights of the tumult, the revolutionaries of Benghazi on ribat on their frontlines: be patient, endure and be firm, for you are on the pinnacle of Islam, pushing back the aggressor and defending the religion, honour and land, so may God strengthen you and protect you, oh crowns of the heads. And we also say to you: just as we know that you are a people for praise and commendation, so by the capacity of your chests and the soundness of your modesty, you are also a people for censure and advice. Though you have done well in one of the greatest obligations- few are those who undertake it- and that is pushing back the aggressive enemy, some of you have also delayed in undertaking another obligation- and it is among the greatest obligations and a great condition to bring about victory: and that is that you must unite ranks so as to make them one rank. This is just as God- Exalted and Almighty is He- loves, when he said, "God loves those who fight in His path as one rank as though they were a structured edifice." The Messenger of God (SAWS) said: "You must gather and beware of division, for Satan is with the one and more distant from two, and whosoever desires the midst of Paradise, let him embrace the gathering. Whoever rejoices in his good deeds and grieves over his evil deeds, then that is the believer.."- so close your ranks, gather your force, and beware of division and dispersal, for indeed they are a cause for every woe. And to the honest, firm revolutionaries of Libya striving to establish the law of the Lord of the Worlds and rejecting the control of the criminal agents of the West, continue on your path and let your slogan be: 'Establish the religion and do not separate in it.' Be wary of the material world and coming to rely on it, for the Messenger of God (SAWS) said: "It is not poverty I fear for you, but rather this world will be opened up for you as it was opened up for those before you, and thus you will compete with each other for it just as they did, and it will destroy you as it destroyed them." And we warn you as the warning of one giving advice to his brother: never place your hands in the hands of the West, and do not expect behind their friendliness or companionship conquest, victory or any good. These people only want to realize their interests, so do you want to leave the rule of an Arab taghut for a Western occupation? So you must rely entirely on God (Almighty and Exalted is He), for victory is near and will appear near to you if you know from where it comes: 'And there is no victory except with God.' So if you knock on the door of God- Almighty and Exalted is He- and go on the path of the predecessors in relying on God, know that God will open the path to victory for you if God wills: 'Say, perhaps it will be near.' And know that God- Almighty and Exalted is He- does not give victory to this religion except by its noble people, authentic creed, correct worship, and clear direction towards Him, Almighty and Exalted is He. As for those who innovate, those who replace, those who alter and those who abandon, these people do not support the religion of God, Almighty and Exalted is He. So rejoice in goodness from your Lord and continue in your revolution, and declare your direction clearly: we have not arisen except for God, Almighty and Exalted is He, defending the sacred rights of the religion, so we ask God to bring down His mercies and blessings on you, and that He should enable you to establish the Exalted's religion. 2. To our displaced people: Oh beloved people of our hearts, you who bore the cause with your sons and bore its costs, your reliance is the Almighty's words: "So those who migrated and were driven from their abodes, were harmed in My path and fought and were killed, I will surely remove their misdeeds, and I will surely enter them into the gardens of paradise, beneath which rivers flow, as reward from God. And with God is the goodness of reward." So do not worry or despair, as Satan has conjured up for the people's eyes false victory and partial tamkin [establishment of rule], for the dawn of the clear victory follows the night of the oppressors, so purify your intentions and place them before God, Almighty and Exalted is He. 3. To our people in the western region, you were truly our people and more. We will not forget your deeds from goodness of reception and provision of refuge. May God reward you best. 4. To our beloved people we say: you are today at a dangerous crossroads in which the agents of the West have entangled you, and there is no way for you to get out of it except by clinging to God the Exalted. The Almighty has said: "And hold fast to God's rope entirely and do not separate." And you must return to the closing of ranks on which you were on the 17th February, that day on which deeds fulfilled words when you came out to overthrow the taghut Gaddafi. So, our people, there is nothing before you except to fear God, Almighty and Exalted is He. And strive to implement the ruling of His law that God Almighty commanded you to establish, fulfilling the pact, realizing the faith and leaving the stranglehold of life and humiliation that has engulfed our land. Your reliance is the Almighty's words: "And had the people of the villages believed and been pious, We would have opened up for them blessings from the sky and earth, but they deemed it false, so we took from them what they earned." We also call on you to assist your mujahideen sons striving to establish the Shari'a, and support them as you can for they are your lifeline. And do not go behind the people of transgression and corruption calling for laxity and liberation from the religion under whatever name, for they are the basis of woe and its head. 5. To the enemies of the Ummah and those lying in wait for it: know that jihad continues till the Day of Judgement, and the wars may bleed the generation of sacrifice only so that the generation of tamkin [establishing the rule of the religion] might live, so delight in a coming generation that will overcome you, while you will not be able to overcome them: a generation nurtured amid the clanging of the swords and clash of the spearheads, a generation that has seen its father killed, its brother taken prisoner, its mother bereaved, and its house burnt, so the meanings of sacrifice have taken root in its origin and heart, a generation that will by God's permission tear you out from your roots and alight the ground from underneath your feet. Following on from the reasons mentioned above, the testaments offered to you by your sons in Ansar al-Shari'a, and the concluding messages that we ask God- Almighty and Exalted is He- to grant a place in your hearts, we announce to the Ummah and the mujahideen generally and to our people in Libya especially the official dissolution of the Ansar al-Shari'a group in Libya, so that its history may be written in golden liquid on the pages of pride and glory in the history of our Ummah after a path rich in da'wa and jihad, a path in which Ansar al-Shari'a offered its leaders and fighters emulating the people of the ditch [a story in the Qur'an about people thrown into a ditch and set on fire for their faith in God] in their steadfastness on God's religion, their tongue and their saying: Either we live in the shade of glory, or we die as martyrs. Thus we will have opened the path for those besides us from the true sons of this Ummah to bear the trust after us. Thus we ask God to grant success to everyone working to support this religion, and God is the one behind the intention. And our last call is praise be to God the Lord of the Worlds.